Early mornings. When it comes to the time of day that makes the most sense, early mornings are best (5am-9am). By watering your lawn during this time window you will reduce the risk of water evaporating before it reaches your lawns roots and it will allow for the roots to grow deeper into the ground. This, in turn, will make the lawn more drought resistant during the hot summer months. Water less frequently, and deeper when you do. Kentucky Bluegrass, the most common grass used for household turf, needs to have water reach its roots at about a depth of 6 to 8″. One thing to keep in mind though is that your sprinkler may not be distributing the water evenly across the entire lawn. For this reason, if you have a hose-attached sprinkler, we recommend rotating the sprinkler every 5-10 minutes to help ensure an even watering. To test how deep the water is reaching after you irrigate, simply use a shovel to cut down into your turf and split it open approximately one day after watering. You’ll see a wet zone and a dry zone below it. If you watered for 15 minutes and the soil is only deep to 3″, you know you need to water for 30 minutes going forward. Consider purchasing a rain gauge. As we mentioned before, overwatering your lawn can lead to the growth of various molds and mildews, and a great way to avoid that is through the use of a rain gauge. Simply set up your rain gauge and monitor it throughout the spring and summer months. If, for example, it rains a 1/4 inch on Sunday, and you plan to water your lawn on Monday, you can likely reduce your watering time in half. Or, if it happens to rain 1/2 inch on Sunday, wait at least 2-3 days before watering your lawn (pending it doesn’t rain again). Don’t be afraid to let the lawn go dormant. Your lawn, and plants in general, are extremely resilient. After all, they live outside for their entire lives and can withstand freezing temperatures and extreme heats. If you notice that even with maintaining an efficient watering schedule, that your lawn is starting to brown and “die” we recommend that you let it do its thing. 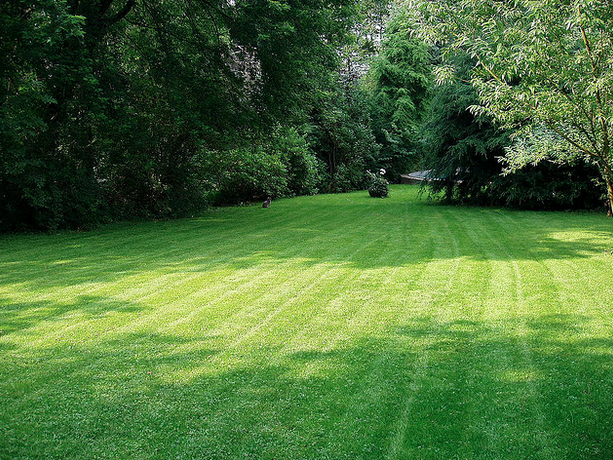 In most cases the lawn is simply going dormant, and when the fall and winter rains return, so will your lawn. Looking for other ways to save water and money throughout your home? Be sure to check out our green home improvement projects: Green Living Ideas, after all, is a top 20 home improvement website.